GREENWOOD—Throughout the upcoming year, one of the ways that parishes across central and southern Indiana will observe the 175th anniversary of the founding of the Archdiocese of Indianapolis will be by encouraging their families to pray for vocations. The archdiocesan Office of Priestly and Religious Vocations is sponsoring a Parish Vocations Cross Initiative in which families will receive a crucifix and a packet of prayers during their parish’s weekend Masses that they will pray together in their home each day in the coming week. They will then pass on the crucifix and prayer packet to another family at the following weekend’s Masses. 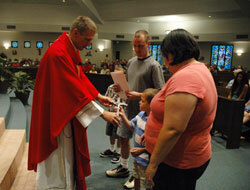 Father Rick Nagel, the archdiocese’s associate director of vocations, helped craft the program. “I don’t think you can help but move people’s lives if they take it home and they’re praying with it with their kids or their spouse,” said Father Nagel, who also serves as associate pastor at Our Lady of the Greenwood Parish in Greenwood. “The prayers are powerful,” he said. Although there are days dedicated to praying for an increase of vocations to the priesthood and religious life, the prayers offer a broad vision of vocations. There are prayers for those called to married life and to help those who are single to live a life of holiness. The universal vocation to holiness given to all the baptized receives special emphasis. The prayer packet also includes daily discussion questions, suggestions of Web sites to visit, and activities that families might do together, such as visiting a nearby religious community or praying for vocations as a family at a perpetual adoration chapel. The vocations crosses were given to families beginning on Sept. 14, the feast of the Exaltation of the Holy Cross. Brian and Jennifer Brown and their young sons, Joshua and Marcus, received a cross and prayer packet that Sunday at Our Lady of the Greenwood Church in Greenwood. Father Stanley Herber, pastor of St. Gabriel Parish in Connersville, likes the initiative and is presenting vocations crosses and prayer packets to families at each of his parish’s three weekend Masses. Although as associate vocations director Father Nagel is approaching encouraging vocational discernment from several directions, he knows that fostering prayers for vocations in an initiative like this is of the utmost importance. “It’s a foundation of our beliefs as Catholics that when we come to God in prayer, he will always listen,” Father Nagel said. “He’ll change lives.